Black Seed Oil - Organic, 16 fl oz (Heritage Store) - Penn Herb Co. Ltd. Known as "the seed of blessing," research suggests this powerful antioxidant oil may offer nutritive support that may benefit a healthy immune system. 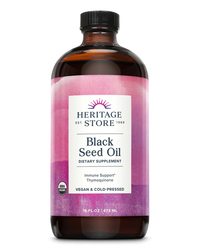 Health practitioners around the world note black seed oil's unique essential fatty acids. AMOUNT PER SERVING (1 TSP/5 ML): Organic Black Cumin Seed Oil (Nigella Sativa) 4.6 g. OTHER INGREDIENTS: None. Our 100% pure organic black seed oil is cold-pressed in accordance with sustainable, kosher, and halal standards. It is naturally free of solvents, alcohol, fillers, preservatives and gluten for your good health. Alcohol-free. Immune system health; source of unique essential fatty acids to help balance the body; phyto-nourishing properties soothe and cleanse digestive tract. Use only as directed. Take 1 tsp. up to 2 times daily with food. WARNING: Do not use if safety seal is broken or missing. Keep out of reach of children. Keep your licensed health care practitioner informed when using this product. Do not use if pregnant.